Fall is officially here and Halloween will be here before we know it. Halloween is my favorite holiday because I love Halloween Crafts and having fun with food to create creepy and not so creepy items. 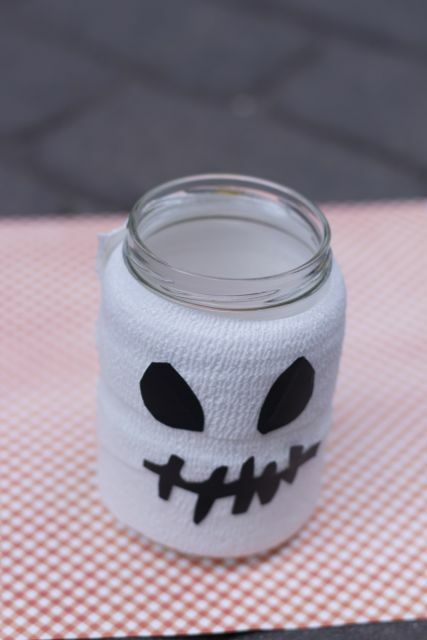 My Halloween crafts and food are more geared toward the fun and whimsical Halloween versus the more scary side. You won’t find me in a haunted house, well maybe only the one at Disney World but no one is chasing you there. 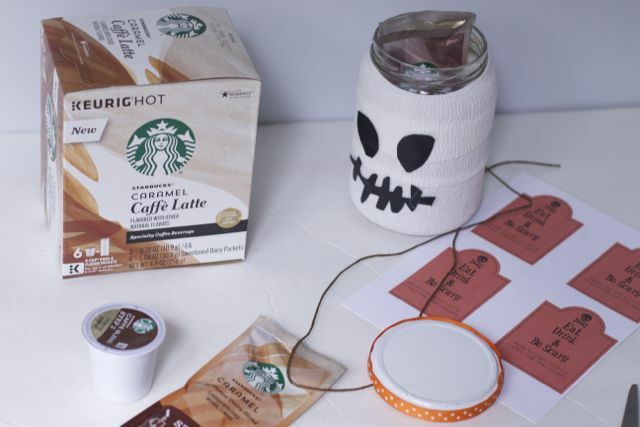 For this Halloween, I decided to make these cute Coffee Halloween Teacher Gift Ideas that will give your teachers the extra mid-day perk up! When working with kids, one can always use a little indulgence mid-day. 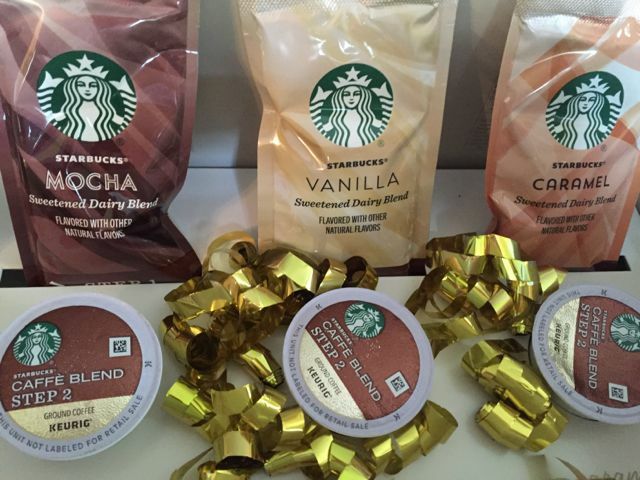 Have you seen the Starbucks® Caffè Latte K-Cup® Pods ? Your teacher will love them since they are made from milk, with no artificial flavors, and they come in 3 great Starbucks® signature flavors (Caramel, Mocha, and Vanilla) and 2 beloved Starbucks® seasonal flavors (Pumpkin Spice and Peppermint Mocha, available for a limited time). Have I gotten your interest yet? This is not your ordinary K-Cup® Pod, in order to have the gourmet hot beverage you have to take one extra step. Really it takes an extra second. Ok now that I have you hooked on these fun new coffee flavors you can make at home, how about gifting these coffee gems to your awesome teachers for Halloween. I have thought of a few different ways to package theStarbucks® Caffè Latte K-Cup® Pods like this fun Coffin or Bat holders. Be sure to check out the Halloween Cookies I made that can be packaged up as well to go with the coffee or on their own. 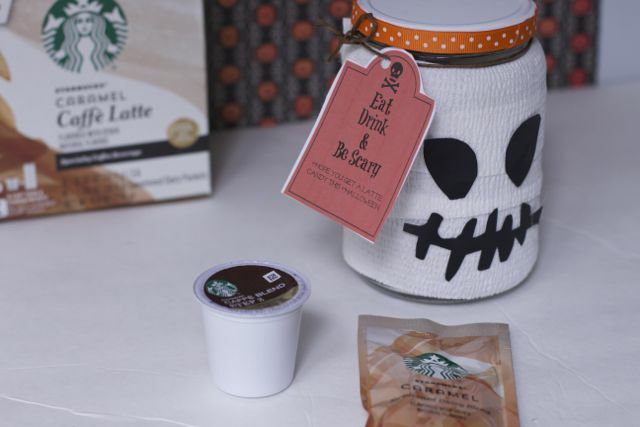 You might already have everything you need for these Cute Coffee Halloween Teacher Gift Ideas at home. 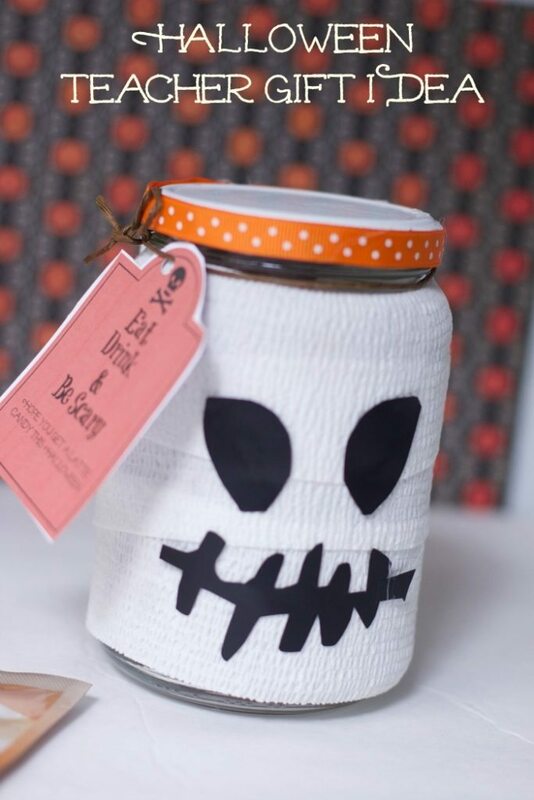 A clean glass jar with a lid, gauze, white spray paint,black duck tape and one of these free Halloween teachers gift printables. 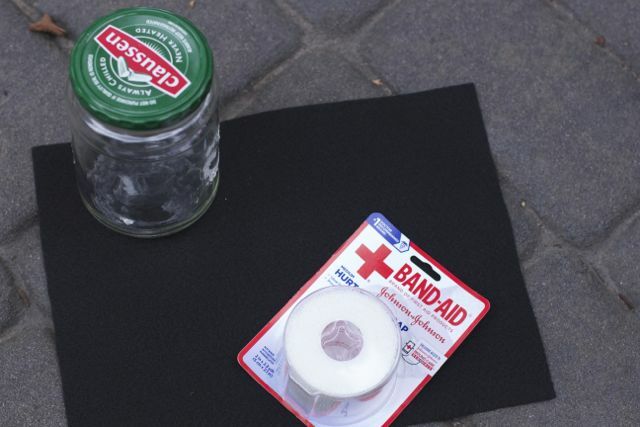 Attach the end of your gauze to the jar with a little glue and start wrapping the jar in a Mummy fashion. Glue the end as well. 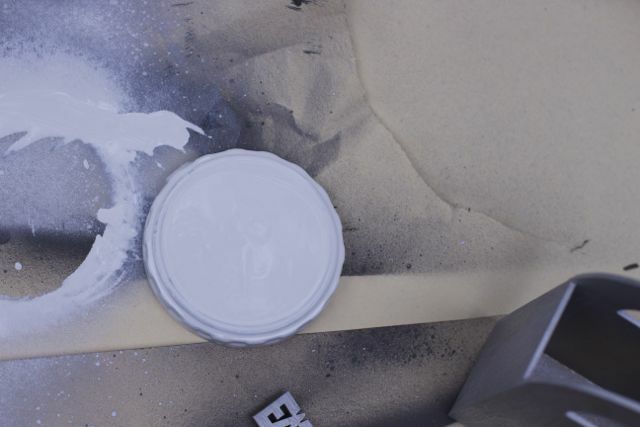 Spray paint the jar top if there is writing on it. We chose to paint our jar lid in white. 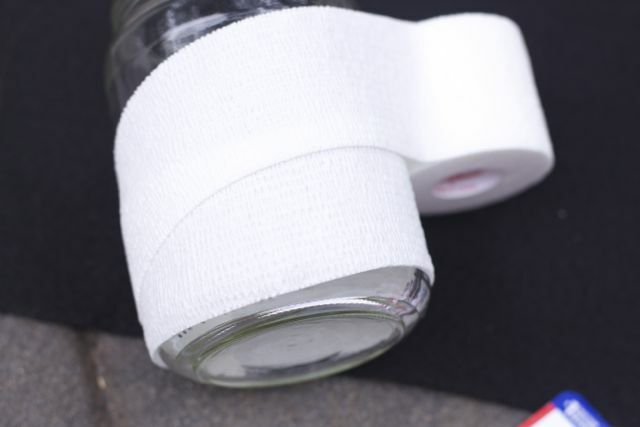 I attached some ribbon as well. Using black felt or duck tape cut out the eyes and mouth. Even though I used tape, I still hot glued them to the gauze. 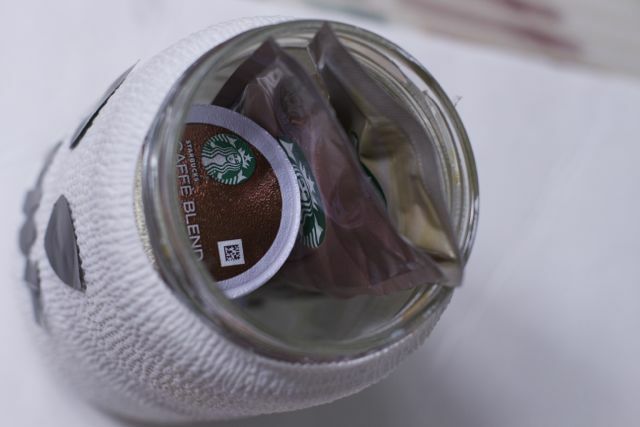 Fill the jar with the Starbucks® Caffè Latte K-Cup® Pods and flavor packets. 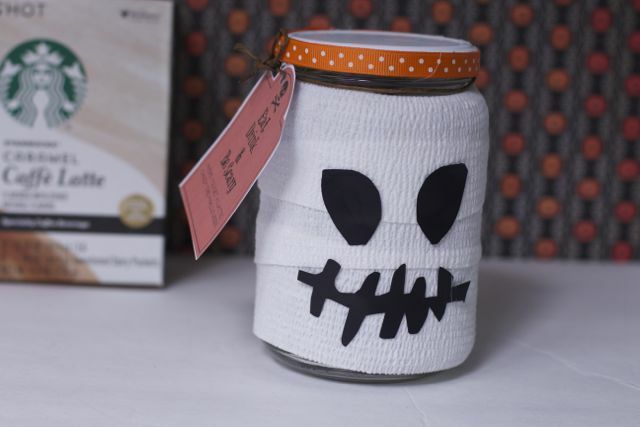 Add the free Halloween teachers gift printable and attach with some twine. 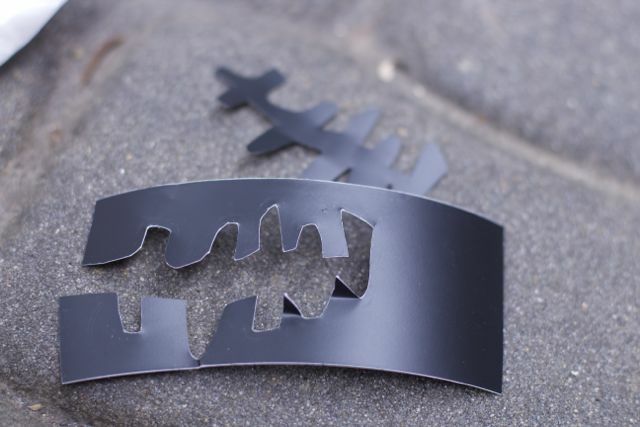 What teacher would not be thrilled to be greeted on Haloween with this fun teacher’s gift? Why not give them to your all Mummy friends too!! 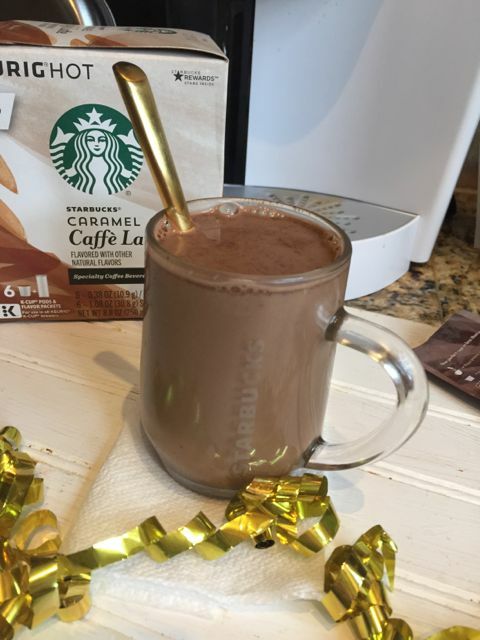 Be sure to check out our quick video on just how easy it is to brew the Super Flavorful Starbucks® Caffe Blend K-Cup® pod in your Keurig® brewer at home or at the office. Which flavor would you want to try first? Why not surprise your teachers all year long! they are always doing something special for our kids. Thanks Laura, it is inexpensive way to let your teacher know you are thinking of them. This teacher would love a gift like this! Very cute and easy! Love it. Such an adorable idea. I would definitely try the vanilla first. These are too cute! I want to have my kids make them to just have around the house. i want to try them all. Oh wait i have i live at Starbucks. this is a great teacher gift idea. The kids’ teachers love Starbucks. This will be a great idea as a little Fall treat!